JPA 2.0 defines an ElementCollection mapping. It is meant to handle several non-standard relationship mappings. An ElementCollection can be used to define a one-to-many relationship to an Embeddable object, or a Basic value (such as a collection of Strings). 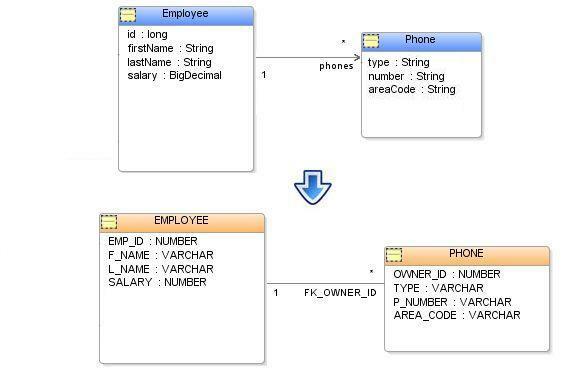 An ElementCollection can also be used in combination with a Map to define relationships where the key can be any type of object, and the value is an Embeddable object or a Basic value. In JPA an ElementCollection relationship is defined through the @ElementCollection annotation or the <element-collection> element. The ElementCollection values are always stored in a separate table. The table is defined through the @CollectionTable annotation or the <collection-table> element. The CollectionTable defines the table's name and @JoinColumn or @JoinColumns if a composite primary key. An ElementCollection mapping can be used to define a collection of Embeddable objects. This is not a typical usage of Embeddable objects as the objects are not embedded in the source object's table, but stored in a separate collection table. This is similar to a OneToMany, except the target object is an Embeddable instead of an Entity. This allows collections of simple objects to be easily defined, without requiring the simple objects to define an Id or ManyToOne inverse mapping. ElementCollection can also override the mappings, or table for their collection, so you can have multiple entities reference the same Embeddable class, but have each store their dependent objects in a separate table. The limitations of using an ElementCollection instead of a OneToMany is that the target objects cannot be queried, persisted, merged independently of their parent object. They are strictly privately-owned (dependent) objects, the same as an Embedded mapping. There is no cascade option on an ElementCollection, the target objects are always persisted, merged, removed with their parent. ElementCollection still can use a fetch type and defaults to LAZY the same as other collection mappings. An ElementCollection mapping can be used to define a collection of Basic objects. The Basic values are stored in a separate collection table. This is similar to a OneToMany, except the target is a Basic value instead of an Entity. This allows collections of simple values to be easily defined, without requiring defining a class for the value. There is no cascade option on an ElementCollection, the target objects are always persisted, merged, removed with their parent. ElementCollection still can use a fetch type and defaults to LAZY the same as other collection mappings. The JPA 2.0 specification does not provide a way to define the Id in the Embeddable. However, to delete or update an element of the ElementCollection mapping, some unique key is normally required. Otherwise, on every update the JPA provider would need to delete everything from the CollectionTable for the Entity, and then insert the values back. So, the JPA provider will most likely assume that the combination of all of the fields in the Embeddable are unique, in combination with the foreign key (JoinColumn(s)). This however could be inefficient, or just not feasible if the Embeddable is big, or complex. Some JPA providers may allow the Id to be specified in the Embeddable, to resolve this issue. Note in this case the Id only needs to be unique for the collection, not the table, as the foreign key is included. Some may also allow the unique option on the CollectionTable to be used for this. Otherwise, if your Embeddable is complex, you may consider making it an Entity and use a OneToMany instead.